It's More Than Training. It's About Forming a Relationship. At Prairie Path, it’s our goal to improve dog/human companionship. A good relationship starts with understanding and respect and should be reflected in how both behave toward each other. Our programs start here: finding the balance between consequence and reward. This ‘Balanced Method’ simulates real, everyday scenarios that allow your dog to make a choice. The result is understanding good choices are rewarding. We strive for a relationship that is honest and achievable for today’s dog and owner. We’ve designed programs to make your decision easier when it comes to forming a happy, healthy relationship between you and your dog. We’d love to answer those for you! Our beginner training courses are designed to get pups off on the right paw. You’ll spend time building a training plan with your trainer and have the opportunity to ask questions to set your pup and yourself up for success! •Introduction to Training – In this session you’ll begin to start working on training prep. Before you can start any training your puppy needs to know how to be a good listener. 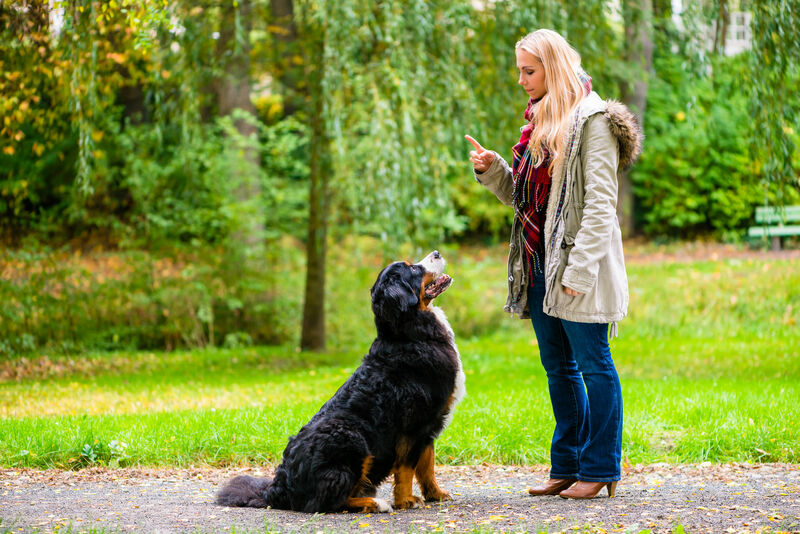 You’ll focus on teaching them their name, basic commands (down, sit and stay) and leash handling. You may have already gotten started yourself! •Review and Reinforce – Your third and final session will review your progress, review the training plan and work on reinforcing their newly learned skills and curb bad behaviors. Questions are welcomed as well. Our main training courses are designed to give a dog and owner a solid training foundation. Each additional level will not only teach new skills but provide significant improvement to technique and execution. We are proud to offer AKC Certifications at the end of some of our programs. All of our training classes except for the Puppy Pre-school are designed in such a way that upon completion a trainer can work with your dog to pass an AKC exam. AKC certifications are recognized worldwide and are proof of an owner’s commitment to their dog’s good behavior and the dog’s accomplishment. Ask a trainer or visit American Kennel Club’s website for more information.